As a tribute to my former non-keto self, I created this Low-Carb Chicken Salad. In college, my favorite chicken salad came, unexpectedly, from a sushi place that also had a deli counter. What made this chicken salad so special was the addition of grapes, pecans and the perfect mayo to chicken ratio. The chicken wasn't too big in size, but also not shredded like some places do it (wrong). The Secret Ingredient To The Best Chicken Salad! Chicken salad is my go-to at any place that serves it, from Wawa to your reliable corner deli. I've tried my fair share. What makes this chicken salad recipe so different (in all the best ways possible) is the addition of sour cream. Yes, creamy, smooth, subtle in flavor, sour cream! If you haven't tried it yet, I suggest adding it to everything! Ok, maybe not everything, but it really takes this chicken salad to another level of deliciousness. What Makes For An Easy Chicken Salad Recipe? Making chicken salad can be as easy as you want to make it! You can use canned chicken, buy a whole roast chicken from the hot section of the grocery, boil a chicken in water in the microwave or on the stove, or sear it in a pan with some coconut oil/ghee. It really depends on how much time and patience you have. Personally, I would go any route you see best fit. For this recipe, I pan seared the chicken thighs because I like my chicken a little crispy, but traditionally you'd boil it in hot water. However, it's really all about what you add to the chicken that brings it all together! We don't shy away from bringing you delicious chicken recipes here in the KetoConnect kitchen. If your family is keen on chicken just like ours, you should feed them our easy cas﻿﻿hew chicken and low carb chicken meatballs on any given night! 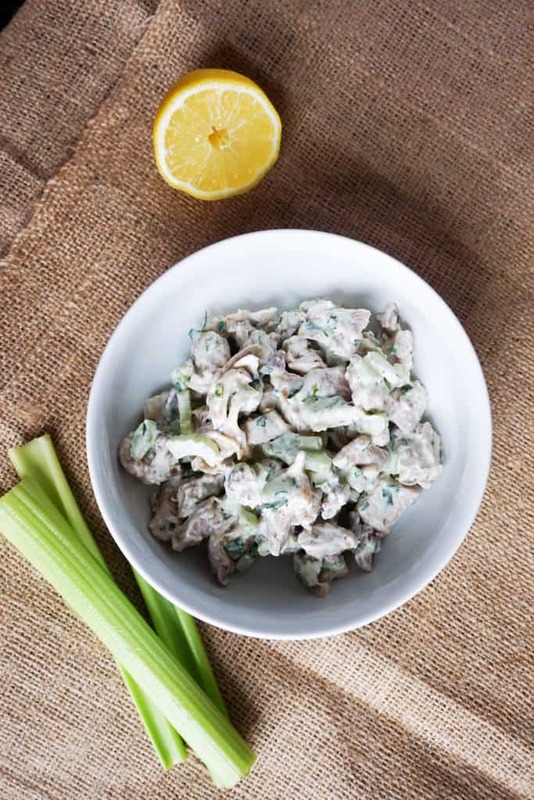 If those don't satisfy them quick enough try using this low carb chicken salad to make sandwiches with our keto bread! 1. Cut chicken into bite sized chunks. Add 1 tbsp coconut oil to a medium heat pan and add the chicken. Cook fully through. Combine all the ingredients above except the pecans and cooked chicken into a bowl. Once fully combined add the chicken and toss. Add the pecans and toss again. Store in fridge and serve cold!